The Salt Lake City Council met in work session to address possible changes to city ordinance regulating the city's one horse-drawn-carriage business, Carriage for Hire. The company drew scrutiny in August when one of its horses collapsed downtown in 98-degree weather. 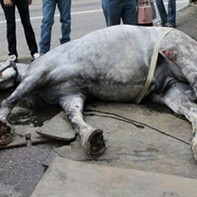 Activists were quick to document the horses collapse (pictured) and called the horse's owner out for later misrepresenting the health of Jerry, who would later die. Activists have cried animal cruelty, while the owners have said Jerry's passing was because he suffered from colic. In the meantime, Salt Lake City Councilman Charlie Luke began drafting a proposal for an ordinance change and enlisted staff to research horse-drawn-carriage policy in 19 other cities in the nation. Luke's draft proposal would, among other changes, create a designated route for carriages, would increase breaks for horses, set 8-hour maximum shifts, prohibit horses from working in bad weather and change the current temperature standard for when horses can work. The current ordinance is based on a “heat index” that combines temperature degrees with humidity, Luke's proposal would simply base the ordinance on temperature, to keep horses from hauling humans in weather below 26 degrees or above 90 degrees Fahrenheit. But from the outset, a number of council members were skeptical about moving forward with a new policy. Councilman Soren Simonsen felt that the Jerry incident was an unfortunate, but isolated, incident, a point reinforced by city council staff, who reported that the Carriage for Hire company has had a history of compliance with county* inspections. Sorensen also argued that there are plenty of city workers and others who work outside in the summer heat. Councilwoman Jill Remington-Love questioned why the issue was being rushed, if the council were prioritizing the issue simply because of having received so much negative feedback from people, many of whom were from outside of the city, state and even the country. Eventually, the council decided to vote on a number of proposals for how to move forward, including the option of banning horse-drawn carriages outright, a proposal that was rejected by the council. Another option presented was that the council would let the Salt Lake City Mayor's Office study the issue and work with other agencies, like Salt Lake County Animal Control Services and even state entities, before recommending a new policy. The idea was liked by some on the council, who felt that they lacked information to move forward, but it frustrated Luke, who said it did a disservice to the hundreds of pages of research already compiled by city staff on best practices from cities across the country. “You've been informed,” Luke challenged. “If you didn't read the report, that's one thing, but to say we're uninformed on this -- that's not true.” Regardless, when put to a vote, the council shot down a recommendation to use Luke's proposal as a framework for moving forward. They also voted against meeting again on the subject before the end of the year. Instead, they voted to refer the issue to the Mayor's office and other agencies for long-term study. They also voted to have city staff research an idea proposed by Councilman Luke Garrott that would investigate regulating horse-drawn carriages through contract, instead of through ordinance. Contract regulation -- like the way the city regulates taxis, Garrott argued -- would give the city more oversight and control over the company, since its contract would be up for review periodically every several years. Salt Lake City Councilman Kyle LaMalfa respected that the council would gather more information before a major policy overhaul, but also lamented that an interim fix like Luke's proposal got voted down.